Microsoft Office has a built-in clock that keeps track of how long you’ve had every document open. It stores this as meta data that you can access at any time. How long did it take you to write your dissertation? How about editing your resume? Whatever the case, figuring out how long you had a document open in Office 2013 is an easy trick compared to 2010 and previous versions. And, fear not. Even if you don’t feel like opening up an Office program just to check, there is still a way to check from the Windows desktop because of Office stores this timestamp as metadata. In Office 2013 applications it’s so easy that I took it for granted until I became curious earlier today. Just click the Info pane (at the top-left), and you’ll see Total Editing Time displayed in the right-hand column. 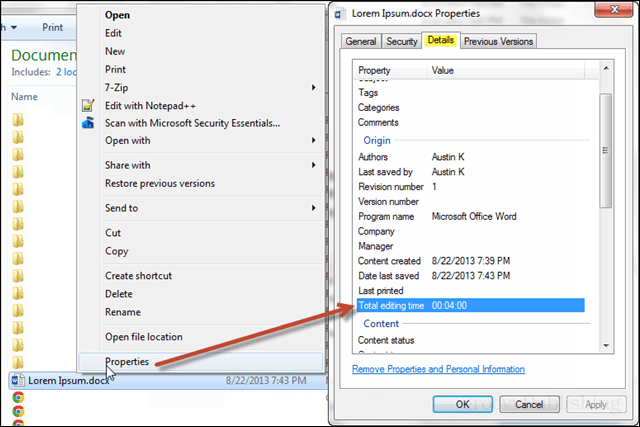 To view editing time in Windows, track down the file using Windows Explorer and then right-click on it and select Properties. In the details tab, you’ll see Total editing time. And that covers it. Tracking editing time in Office 2013 is so easy that even a caveman wouldn’t have any trouble. 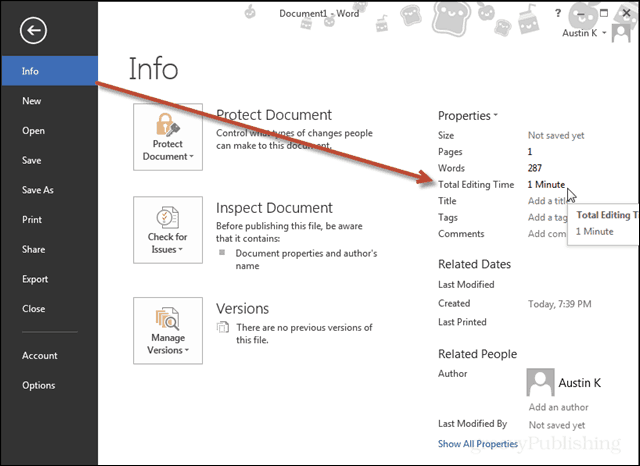 There is one caveat, though, and that is that time is counted based on how long the document is open in the Office app and not just when it’s active – unless it’s minimized. I hope you enjoyed this groovy quick-tip. Do you have a Microsoft word tip? Let us know about it in the comments!